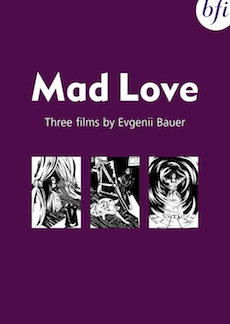 Three films by Russian film pioneer Evgenii Bauer, highlighting his technical mastery and underscored with his preoccupation with doomed love and death. It was only in the dying days of the Soviet regime that the work of the Russian film pioneer Evgenii Bauer was rediscovered and celebrated. Before a premature death in 1917 he made over 80 films, of which more than 20 survive. This selection highlights his preoccupation with doomed love and death as well as his creative use of light and mastery of camera movement. Twilight of a Woman's Soul (1913): Bauer's first surviving film already shows his masterful use of deep-focus photography. After Death (1915): Adapted from a story by Ivan Turgenev it is imbued with one of Bauer's favourite themes: the psychological hold of the dead over the living. The Dying Swan (1916): Takes a sardonic view of the popular obsession with morbidity and includes a chilling dream sequence. This compilation features a specially commissioned new music score for each of the films, by Laura Rossi, Nicholas Brown, and Joby Talbot. Video essay by Russian film historian Yuri Tsivian.